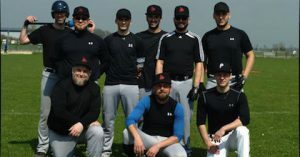 The Laub Raiders before their historic first game in German baseball. 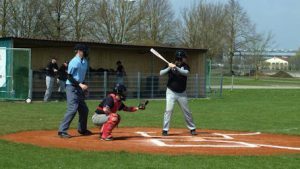 the Landesliga 2×5 as Laub dropped to 0-2 to start their first season. the Laub players can learn. Magnus Brose and then scored on a wild pitch. single hit in the inning. getting a walk in the top half of the scoreless frame. added four hits in tallying six runs to open an 8-2 lead. stranding three Red Lions with the final out. 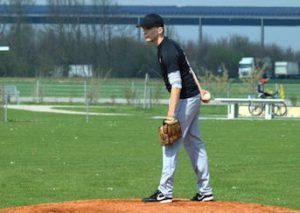 Dave Feddersen did a good job on the mound for the Laub Raiders in their first-ever games in German baseball. Käsewieter to cut the deficit to 9-5.
to four hits and one Laub error to pull ahead 12-5.
and came home on as Tom Groth reached on an error. bases. Csabala walked three times, scoring once and picking up three steals. bottom of the fourth with an inning-ending catch in right field. led 1-0 after two frames. Käsewieter single for a 3-1 lead. Player-manager Uli Käsewieter was the most consistent offensive weapon for the Laub Raiders in their first-ever games in German baseball. the fifth with Oldham singling in Csabala and scoring on a wild pitch. had an RBI, 2 runs and 3 stolen bases. Not that bad of a start after all. There’s still more to come as the season progresses. Nice article, finally some more baseball on the oberpfalz-map!